Uni-Tek, founded in 1969, provides high quality machining services for the aerospace industry. 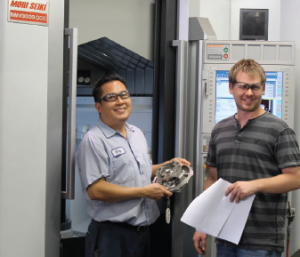 We specialize in machining complex cast and bar stock parts from many different materials, including: Inconel, Titanium, Aluminum, Stainless steels, as well as some plastics. Our 11,000 sq.ft shop includes some of the latest CNC machining equipment and a staff of qualified machinists, inspection personnel, and engineers. Most of our staff has over a decade of experience with us and more than 20 years of experience in the field. Our focus has always been on customer satisfaction, quality, and on-time delivery. We are ISO9001:2015 and AS9100 Rev D certified and we continuously strive to improve our processes and quality to better serve our customers. We welcome all potential customers to contact us to discuss your requirements and to schedule a meeting or a tour of our facility.